Things were looking good for the Capitals heading into Game 3 of the Stanley Cup Final. 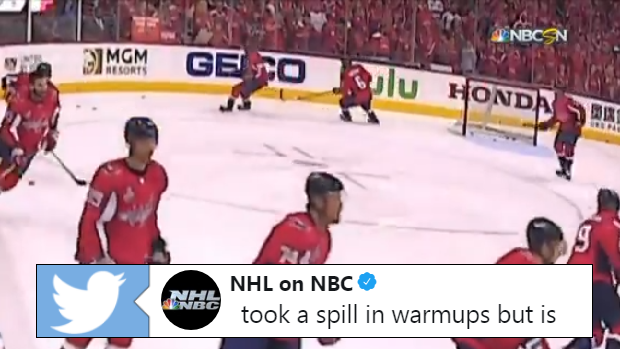 After a huge Game 2 road win, Washington had all of the momentum in the world until they received a scare involving one of their defenceman in warmups. While the team skated laps in its own end, Caps blueliner Michal Kempny hit the deck and slammed his face into the boards. His helmet was consequently forced off his head. Kempny was able to play in the first period but was forced to leave with 0:44 seconds left in the frame. It’s uncertain whether it was for reasons involving his health or equipment, however, he was able to return to action in the second period. He was also forced to leave the ice after the fall initially happened in. Michal Kempny heads to dressing room with 44 seconds left in the first period. Not sure if it's equipment or what, but he of course took that spill in warmups. Losing the Czech would have been devastating for a Capitals team that’s just three games away from winning the Stanley Cup. Kempny was acquired at the trade deadline from the Chicago Blackhawks and has gradually made a nice home for himself with his new team. He currently anchors the first defensive unit alongside John Carlson. If the Capitals can find a way to win, Kempny will look like one of the steals of the deadline. Luckily his wipeout wasn’t too disastrous.